James Black is best known for his work on beta-blockers and for devising a means of curbing stomach acidity to permit the healing of ulcers. Black, with Gertrude Elion and George Hitchings were awarded the Nobel Prize in Medicine in 1988 "for their discoveries of important principles for drug treatments". Sir James Black's findings have made possible the development of new and improved agents for the treatment of angina pectoris, myocardial infarction, high blood pressure and peptic ulcer. In Sweden alone, approximately half a million people were treated in 1987 with the types of drugs which resulted from his research. "[William Weipers] gave me the opportunity to start a new Physiology Department, and during the next eight years I built a state-of-the-art physiology teaching laboratory based on my enduring belief that our brains work best when doing focuses our thinking....I built a workshop-coupled research laboratory providing the most advanced cardiovascular technology I knew... I slowly learned, like a primitive painter, how to be an effective experimenter, ideas began to ferment." His subsequent development of propranolol, the beta adrenergic receptor antagonist (beta-blocker) in the late 1950s, which revolutionized the medical management of angina, is considered one of the most significant contributions to clinical pharmacology of the 20th century. Similarly, his work on histamine receptors in the stomach led to the development of the H-2-antagonist cimetidine, which inhibits the action of histamine on the acid-secreting cells of the stomach wall. Cimitidine was approved by the US Food & Drug Administration in 1977 and when marketed as ‘Tagamet’ became the highest selling drug in the world. Propranolol and Cimitidine continue to be in widespread use throughout the world today. 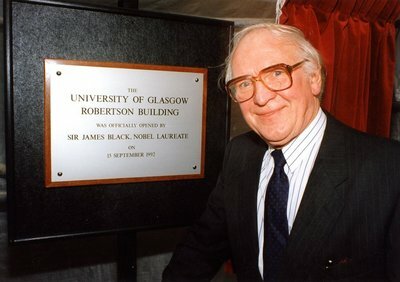 World Changing Project, "Winning the Nobel Prize for Medicine in 1988 ," in University of Glasgow World Changing (University of Glasgow, 2010); http://www.worldchanging.glasgow.ac.uk/article/?id=6 (accessed April 19, 2019). World Changing Project. "Winning the Nobel Prize for Medicine in 1988 ." In University of Glasgow World Changing. University of Glasgow, 2010. http://www.worldchanging.glasgow.ac.uk/article/?id=6 (accessed April 19, 2019). World Changing Project. "Winning the Nobel Prize for Medicine in 1988 ." University of Glasgow World Changing. University of Glasgow, 2010. 19 April 2019 <http://www.worldchanging.glasgow.ac.uk/article/?id=6>.